As Microsoft’s annual Build developer conference nears, a new report suggests that the relationship between Microsoft Windows 10 S and Windows 10 may be more flexible than before. Microsoft said in March that Microsoft will deploy Windows 10 S as a mode of Windows 10. In a blog post at the time, Windows chief Joe Belfiore said that users would be able to buy a new “Windows 10 Home or Windows 10 Pro PC with S mode enabled.” Now, Windows users may be getting a clearer look at what options they have with the Windows 10 operating system installed on new computers. Leaked (and unconfirmed) slides unearthed by Twitter user and Microsoft sleuth WalkingCat seem to offer some additional detail—namely, that you’ll be able to buy either a Windows 10 Home S or a Windows 10 Pro S PC. (Previously, Windows 10 S has been released as a single version, with no Pro or Home differentiation.) Your choices then depend on the version of Windows 10 that you're using. Previously, Microsoft has only offered a path from Windows 10 S to Windows 10 Pro, with no other options. The slides seem to indicate that both a switch and an upgrade would essentially be a one-way street; there would be no going back without recovery media of some sort. There’s no indication, though, that a user couldn’t upgrade from Windows 10 Home S to Windows 10 Pro S, then switch to Windows 10 Pro. At least part of that process appears like it will still be performed by the Microsoft Store app. 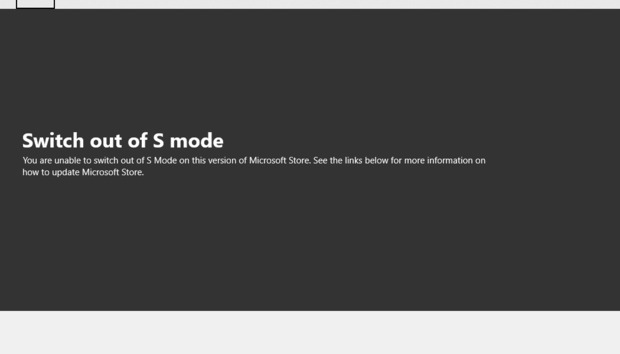 Microsoft has already begun adding a “Switch out of S Mode” “app” (above) to the Microsoft Store, as discovered by Richard Hay. 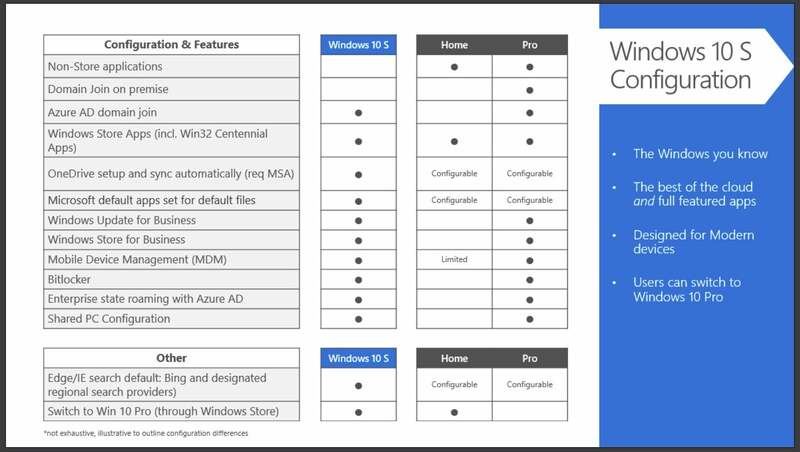 The slides also posted by WalkingCat also confirm that the Windows 10 S features discussed previously, such as in a Dec. 2017 WinHEC session, represent Windows 10 Pro S. That mode’s features included Mobile Device Management and BitLocker, two of several features assigned to Windows 10 Pro S.
Microsoft originally posted this list of Windows 10 S features in December. If the WalkingCat information is true, this feature set would now apply to the Windows 10 Pro S operating system. Windows 10 Home S, by contrast, would include just three key features: a restriction to Windows Store apps, including desktop apps ported with the Project Centennial tool; OneDrive, automatically set up and synced to a user’s Microsoft account; and apps like Word and Edge set up by default to open default file types. The slides also add more confirmation that what has been called Redstone 4, version 1803, or the Spring Creators Update, may in fact be called the Windows 10 April 2018 Update—a name that Microsoft has yet to confirm, deny, or even comment upon. The “April update” has been said to appear when Windows Insiders running the latest 17134.1 Insider build open Edge. (I don’t recall seeing it on my system.) But the new S modes, and the ability to upgrade and switch, are contingent upon the April 2018 Update, Microsoft says. What this means: With Microsoft’s Build developer conference just two weeks away, we should be hearing new information soon about what the new S mode will mean for PCs you buy over the course of the next months, if not the next few years. Let’s hope that Microsoft confirms some of this information at Build—consumers will want to know what their options are.